Microsoft believes that students tend to do well when they have access to a personal and free learning space. Over the years Microsoft has experimented with a lot of educational tools, winning with most of them. With Microsoft Mathematics students who have found math to be a challenge are now happy to have this tool to help at their fingertips. It is a free program designed for educational purpose. This program allows students to solve problems that involve figures, graphs, and calculations. It is meant to be a tool to learn mathematics easily for young minds. 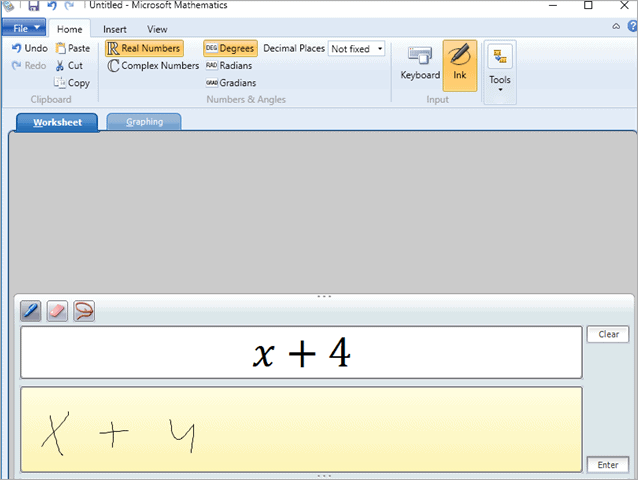 Microsoft Mathematics has withstood most trials and has now several versions of upgrades with very cool advanced features. You may not find Microsoft Mathematics in the Windows Store, but it doesn’t mean that it is officially discontinued by Microsoft. It is available and you can download it and run it on Windows 10. The last version was introduced in 2011. It is compatible with Windows 10. All you need is the exact version of the OS. Based on the information present on the download page, the software is compatible with Windows 7 and above. 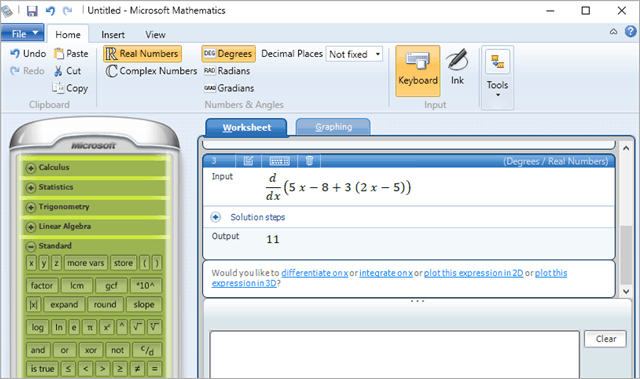 Download and Install Microsoft Mathematics 4.0 here. Please Note: When you try to download, you will be asked to select your compatible version. Make sure that you check in with the correct version. You need to know if you are running a 32-bit or 64-bit system. Choosing the right version for your OS, before downloading Microsoft Mathematics. The interface is easy to handle with every feature clearly mentioned. If you don’t want to type from the keyboard, you can use the mouse. This is to type from mobile keyboard given in the app. 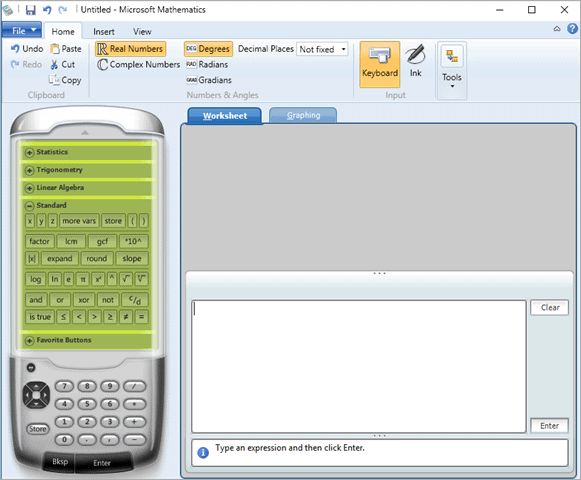 This educational tool from Microsoft helps to do calculations related to Calculus, Statistics, Trigonometry, Linear Algebra along being a regular standard calculator. The UI may not be very fancy, but it has excellent functionality. The big blank box is to type your problem or expression and Microsoft Mathematics will solve it for you in a jiffy. Let’s take a simple example of an algebraic expression 5x – 8 + 3(2x – 5), and see the solution. First, you have to type the expression and click on the Enter. This button is located in the bottom right corner. After displaying the output, it also gives you other options to apply to the expression. 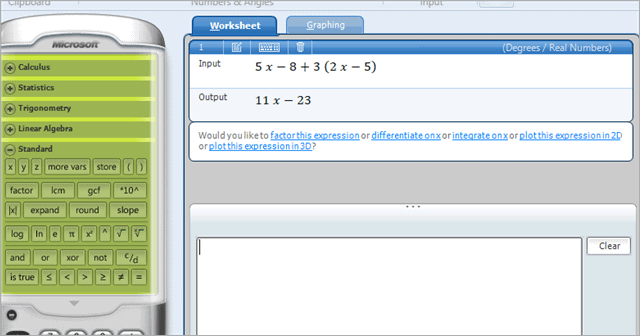 For instance, we again wanted to differentiate X, so we clicked on the option in blue color. Then we gave the command that said differentiate on x. Likewise, you can try other options to solve any problem. Using the different options to work on the basic output and solve complex problems. It also helps you solve problems containing complex numbers and Real numbers. No matter how hard the Trigonometric equation is, it will resolve all for you in a few clicks. 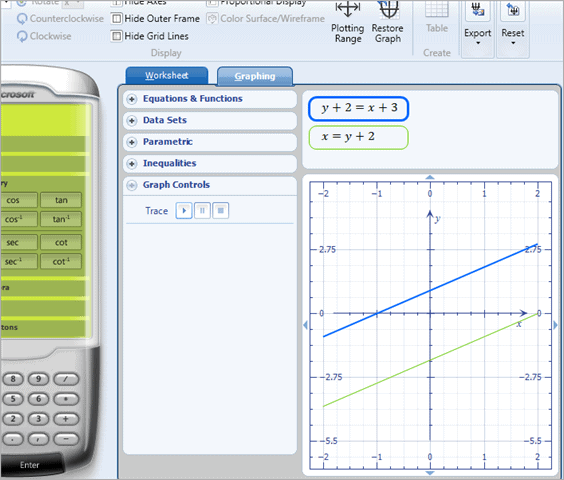 Creating graphs isn’t always easy, but with MS Math it is easy. 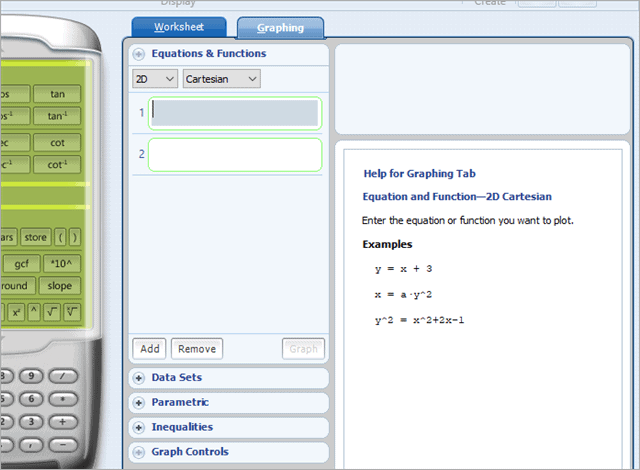 Here you can simply type in an equation and the graph is ready on 2D, 3D, Cartesian, or even Polar. Here is another example. Enter the equations y+2=x+3, x=y+2, and try to create a graph. Given below is the illustration. The blue line of the graph represents y-axis and the green line represents x-axis. Actual mapping of the graph of the solution of the example. It is possible to use an ink too, just like you draw with hands-on Paint. It may seem a bit challenging but with practice, you may get used to it. The choice remains. You have the option of using the ink to write using the mouse or simply type. 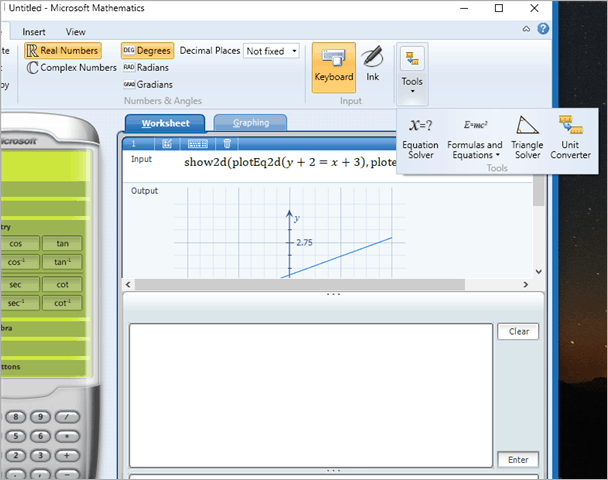 The tools included in Microsoft Mathematics 4.0 are Equation Solver, Formulas, and Equations, Triangle Solver, Unit Converter. You don’t need to remember each formula as Microsoft Mathematics does it all for you. The tools that Microsoft Mathematics has stocked and saved for solutions. So now we have seen that Microsoft Mathematics is a well-organized educational program helping students to understand math equations quickly and find solutions to any type of math, physics, and geometry problems. So if you are a student and really want to be productive while solving some math problems, Microsoft Mathematics may be the ultimate tool to get everything aligned.